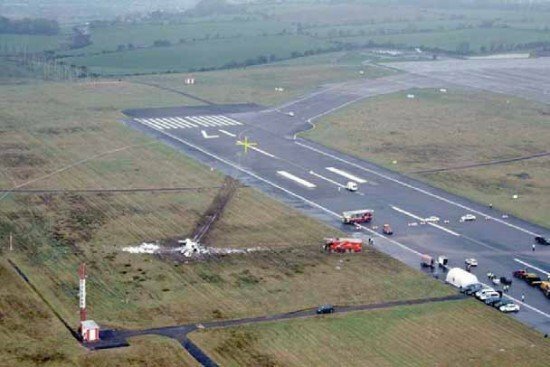 The Irish Air Accident Investigation Unit (AAIU) has published its Final Report into the fatal Metroliner aircraft accident that occurred at Cork Airport in February 2011. The aircraft, a Fairchild SA 227-BC Metro III registered in Spain as EC-ITP, was operating a scheduled commercial air transport flight from Belfast City to Cork with two flight crew members and ten passengers on board. The flight involved three separate undertakings; the operator which held a Spanish Air Operator Certificate (AOC), a ticket seller based in the Isle of Man, and a Spanish company which supplied the aircraft and flight crew under an agreement with the ticket seller. At 09:50 hrs while on the third approach to Cork in low visibility conditions, control of the aircraft was lost during an attempted go-around. The aircraft impacted the runway surface, inverted and came to rest in soft ground to the right of the runway. Post impact fires occurred in both engines which were expeditiously extinguished by the Airport Fire Service. Six persons, including both pilots, were fatally injured. Four passengers were seriously injured and two received minor injuries. The approach was continued in conditions of poor visibility below those required. The descent was continued below the Decision Height without adequate visual reference being acquired. A power difference between the engines became significant when the engine power levers were retarded below the normal in-flight range. Inadequate command training and checking. Systemic deficiencies at the operational, organisational and regulatory levels were also identified by the Investigation. Such deficiencies included pilot training, scheduling of flight crews, maintenance and inadequate oversight of the operation by the Operator and the State of Registration. Four are made to the European Commission Directorate responsible for Commercial Air Transport regarding Flight Time Limitations, the role of the ticket seller, the improvement of safety oversight and the oversight of Operating Licences. Three are made to the European Aviation Safety Agency (EASA) regarding the number of successive instrument approaches that can be conducted to an aerodrome in certain meteorological conditions, the syllabus for appointment to Commander and the process by which Air Operator Certificate (AOC) variations are granted. Two are made to the Operator, Flightline S.L., regarding its operational policy and training. One is made to Agencia Estatal de Seguridad Aérea (AESA), the Spanish Civil Aviation Regulatory Authority, regarding oversight of air carriers. One is made to the International Civil Aviation Organization (ICAO), regarding the inclusion of the approach capability of aircraft/flight crew on flight plans.